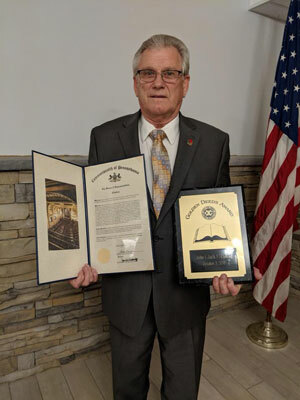 On Wednesday evening, John “Jack” Harhart received Northampton Exchange Club’s 2018 Golden Deeds Award for always giving his time and talent to make the community a better place to live. I was pleased to have a House citation prepared recognizing him on this honor. Congratulations! On Thursday, Oct. 11, from 7-8:30 p.m., I will be hosting a Chronic Wasting Disease Seminar at the Blue Mountain Fish and Game Association, 4190 Wood Drive, Walnutport. A representative from the Pennsylvania Game Commission will speak about Chronic Wasting Disease, how the agency is working to contain it and what residents and sportsmen can do to help. The event will conclude with a question-and-answer segment. To reserve a seat, please visit my website at RepMako.com or call one of my district offices at 610-502-2701 or 610-760-9805. As a free service to the community, I am co-hosting two shredding events in the 183rd Legislative District this month to give residents a chance to safeguard themselves against identity theft by having their personal documents securely destroyed. The first, with South Whitehall Township, will be held on Saturday, Oct. 13, 10 a.m. to noon, at Covered Bridge Park, 2465 Wehr Mill Road, Allentown. The second event, with Sen. Pat Browne (R-Lehigh), will be held on Saturday, Oct. 20, from 10 a.m. to noon, at Robert “Bob” LaBold Maintenance Building, 550 W. Church St., Slatington. Acceptable items include all paper and manila folders. No more than four bags or boxes per household are permitted, and no businesses, please. Staples or paper clips do not need to be removed. For more information, please call one of my district offices at (610) 502-2701 or (610) 760-9805. Pennsylvania has been granted an extended grace period to comply with REAL ID requirements set by the U.S. Department of Homeland Security. The grace period was set to expire Oct. 10, 2018, but has now been extended until Aug. 1, 2019. A final federal deadline for all states to comply is Oct. 1, 2020. This grace period extension means that Pennsylvania residents will not face access issues when entering federal facilities or boarding commercial aircraft through at least Aug. 1, 2019. REAL ID is voluntary for Pennsylvania residents, but encouraged for those who may need to access certain federal facilities, such as military bases, or fly commercial flights within the United States. Residents also have the option to use other, non-REAL ID forms of enhanced identification. Click here for that list. Residents wishing to obtain REAL ID-compliant driver’s licenses and photo ID cards can obtain them, beginning in March 2019. In the meantime, customers are encouraged to pre-verify for REAL ID the required documentation as soon as possible, giving them ample time to prepare. One of the required documents is a certified copy of a birth certificate, which can take up to several months to process, depending on one’s circumstances. My office can help residents with birth certificate applications. Call or stop by for more information. More information about REAL ID, including frequently asked questions, can be found at dmv.pa.gov. This week, the House unanimously approved legislation to help ensure proper upkeep of the graves of Pennsylvania veterans. Under current law, counties are required to place a marker and a U.S. flag on the graves of all honorably discharged veterans. These U.S. flags are to remain up from Memorial Day through the Fourth of July. However, House Bill 1471 would enhance current law to ensure cemeteries remove torn and weathered flags after the Fourth of July annually, and allow a veteran’s family member to keep them if they choose. The legislation would also clarify current law to ensure greater communication between cemeteries, local veterans organizations and county commissioners, who are currently required to provide the flags. The bill now moves to the state Senate for review. Bipartisan legislation designed to help parents with day care decisions was passed by the House this week and sent to the Senate. House Bill 1742 would require all state licensed child care centers to post their Keystone STARS rating in a prominent location and on their websites. The Keystone STARS program, operated by the state Office of Child Development and Early Learning, sets quality requirements for early childhood educators based on a four-star rating system. All licensed child care centers that meet the state’s health and safety requirements are required to be part of the Keystone STARS system. The Keystone STARS performance standards are grouped into four levels. The standards address staff qualifications and professional development, early learning programs, partnerships with family and the community, and leadership and management. The goal of the proposal is to help educate parents about day care choices and to encourage low-rated child care centers to improve their programs. Fall leaves are just about to turn across several areas in Pennsylvania, helping to boost tourism activities in many regions. According to the Pennsylvania Tourism Office, Pennsylvania has a longer and more varied fall foliage season than any other state in the nation. Both in-state and out-of-state visitors can find the best places to view fall foliage and track the locations of the peak colors throughout the state, beginning in late September. The weekly fall foliage report is available here. Click here to read more about Pennsylvania’s fall tourism activities. All PennDOT driver license and photo centers, including its full-service center in Harrisburg, will be closed Saturday, Oct. 6, through Monday, Oct. 8, in observance of Columbus Day. Customers may still obtain a variety of driver and vehicle products and services, including all forms, publications and driver-training manuals, online through PennDOT’s Driver and Vehicle Services website, dmv.pa.gov. To honor those who have fought breast cancer or are fighting it now, the fountain at the Pennsylvania State Capitol’s East Wing was dyed pink on Tuesday for Breast Cancer Awareness Month. The pink fountain is also a reminder to all women of the importance of mammograms and early detection. 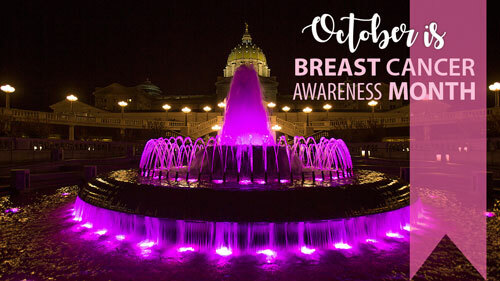 This week, the House also passed House Resolution 1048 recognizing October 2018 as “National Breast Cancer Awareness Month” and Oct. 19, 2018, as “National Mammography Day” in Pennsylvania. The American Cancer Society estimates that 268,670 women and men in the United States will be diagnosed with invasive breast cancer this year, and that’s why it is important to continue to educate the public about breast cancer and stress the importance of routine self-breast exams, regularly scheduled doctor visits and yearly mammograms as recommended.